Royal Blog Tour-For All You Do! This great little set is on sale this Month so it's the perfect time to add it to your collection! This is the second club card from the weekend, with a masculine look for a birthday card. Card base is Always Artichoke, background is Confetti Cream. 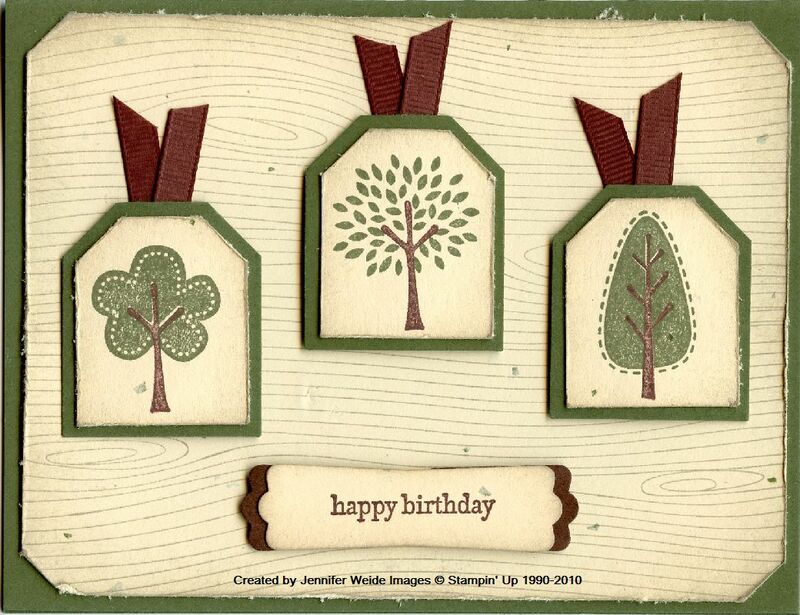 We stamped on the Confetti with the Woodgrain background using Sahara Sand ink. The corners were edged with the Tag Corner punch to match the tags in the center. The edges were sponged with Sahara Sand and then "roughed" with the distressing tool from the Cutter Kit (p. 191). 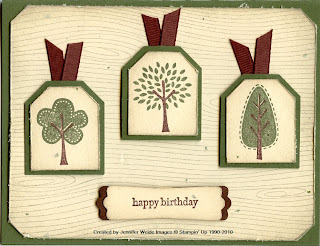 The trees were stamped using the stamp-a-ma-jig in Chocolate Chip & Always Artichoke on the Confetti Cream and punched with the Small Tag Punch. The edges of the tags were also sponged and distressed. We punched an Artichoke tag with the Large Tag Punch and layered the small one on. To the back we added a small piece of Chocolate Chip ribbon using Snail adhesive and attached the tags with dimensionals. The 'happy birthday' from Teeny Tiny Wishes was stamped in Artichoke on Confetti, punched with the Modern Label punch, sponged & distressed. A second Modern Label was punched from Chocolate Chip, cut in half and layered to each end of the Confetti one. Enjoy-back tomorrow with card three! I love this! And boy, do I need male inspiration with all the guys in my family!